The cottage gardens are sporting some new blooms much to my delight! Our temps continue to be cool in the low 70's with a strong marine air influence as we've had many mornings of foggy, misty weather that takes much of the day to burn off. The Willamette valley in contrast has been regularly reaching 90 degrees. 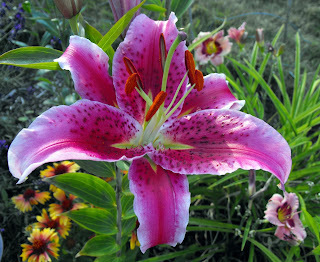 I was thrilled to have all three of my Stargazer lily bulbs bloom this year! I planted them nearly 3 years ago and had not had a single bloom till now. They are magnificent! I found this goldenrod spider on my Shasta daisy devouring this poor honey bee. I was quite upset as we've had few honey bee's visiting this year. Needless to say this garden spider did not survive the night. My first Dahlia bloom of the season! I was given this bulb by a former co-worker and I cannot for the life of me remember what it was called. Regardless, it's a favorite. I love how the colors start out with pretty deep sunset pinks that slowly lighten into shades of salmon pink over the life of the bloom. The last few weeks have found me working 12+ hour days due to traveling for training in Salem, Or. 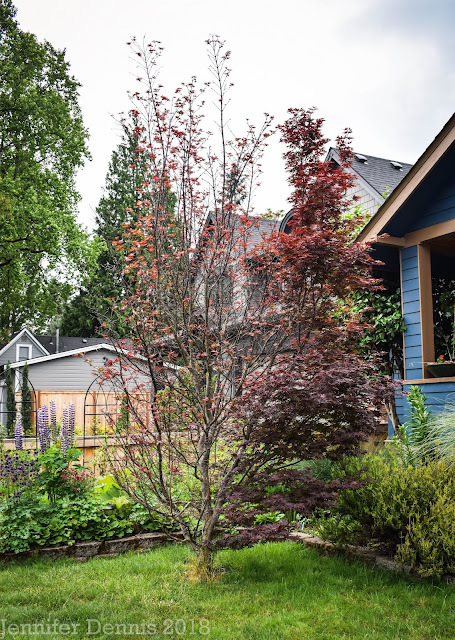 I've had little time during the week to blog or catch up with my favorite garden bloggers...but last weekend I was quite proud, I did manage to finish a few outstanding yard projects. My front flower beds have been crying out for some pretty edging. (My husband too, in order to make mowing easier.) So, I was able to accomplish that project and am pleased with the results. 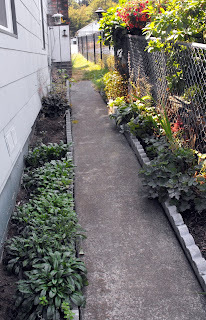 My side garden has also been in need of edging stones. I've been needing assistance to keep the soils in place. Tis a wonderful feeling to have a sense of accomplishment! I moved a few shade plants around as the spot I had originally picked is far too sunny for their liking. (i.e. my sweet neighbor hacked down her pretty hydrangea and hence..less shade) So, I have a new project to commence..I've decided to choose plants and seeds for a cutting garden next year. I've always wanted a cutting garden. 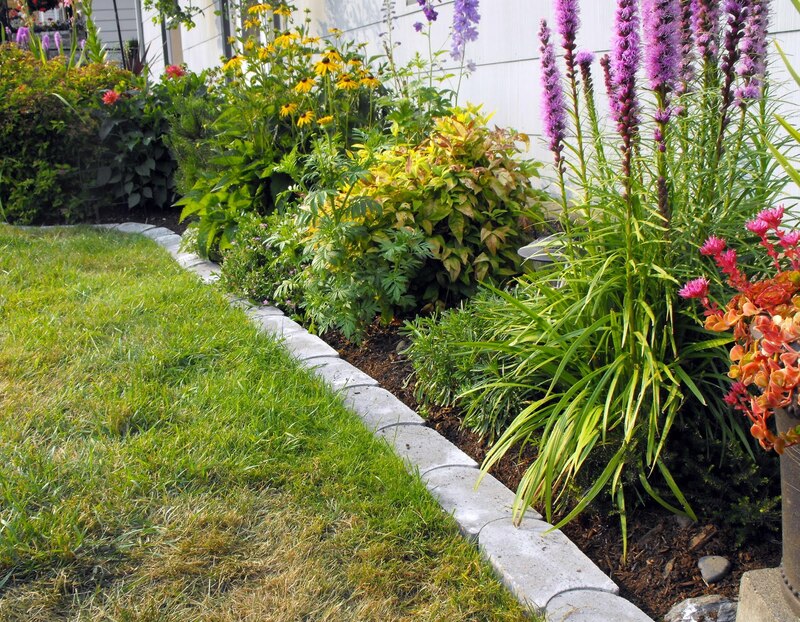 Love your new edging, especially on that first bed. 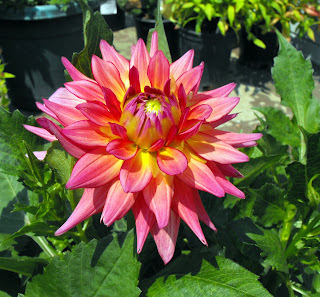 The Dahlia is gorgeous, it would be one of my faves too! Have you ever grown Dahlias from seed? They would work in a cutting garden. I started some this spring, and they have taken their time growing given our rotten weather, but they should still bloom before winter. I can share seeds if you like. Alison..no I have not grown dahlia's from seed, that would be so cool!! I would be very interested in some seeds! Jenny your Dahlia is beautiful. I don't think I'm going to see blooms this year on mine. If so my dinnerplate may make it to a saucer. ;-) I like your first trim too. Maybe I should take out my tall trims and put in flat then he could just mow right up to the garden. As it is now he uses the dang weedeater and I end up with grass growing everywhere in my beds. I hate that! Hi Jenni. That will make a spot for a wonderful cutting garden next year. Stargazer lilies are so pretty. I love the colors in that dahlia. Almost psychedelic. Very pretty! 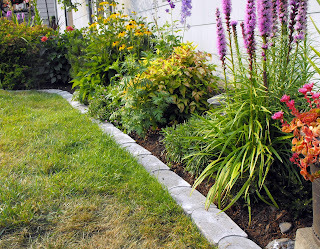 Hi Jenni~~ Your edging looks great. Did you buy it from Willamette Greystone? I was just there with my garden buddy Carol and the prices are SO much better than anywhere else, especially if you go back to the "seconds" pile. Somewhere I heard those evil spiders called crab spiders, probably because they look like crabs. I posted about them on my blog once a few years ago and I got a reply from one guy who said he saw one eat a BUTTERFLY. Are you freaking kidding me? I thought. I hate those damn spiders. 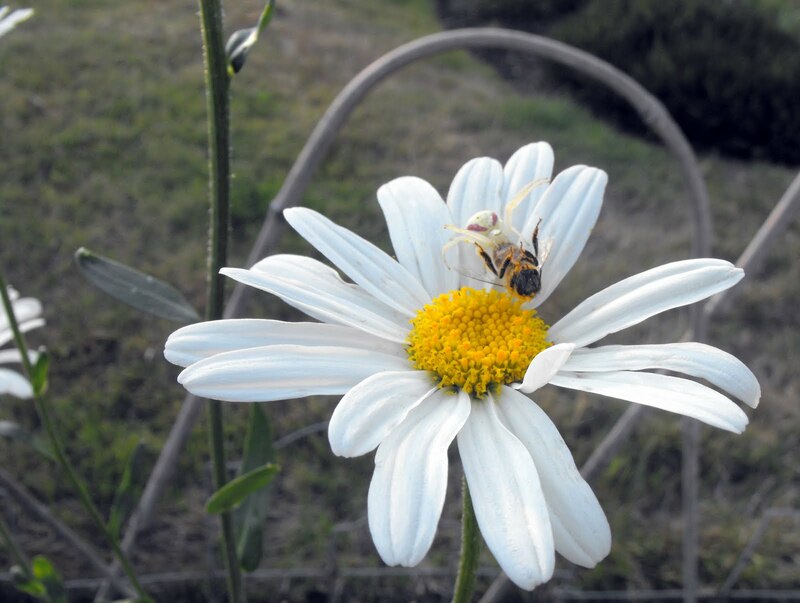 When/if I get to heaven :) I plan to, respectfully of course, ask God why he made crab spiders in the first place. I know God doesn't make mistakes but this one seems so wrong to me. Your flowers are so pretty. Even thought we have had really hot weather recently our toms are still not ripe and other people are saying the same thing, weird! Hopefully inthe next few days.